In the PuMP Measure Design technique, one of the steps is to describe the result you want to measure in sensory specific language. This is a completely new concept to just about everyone, and they usually need a demonstration of what sensory specific language is. So here goes. Sensory specific language is the use of words that describe what we see, hear, touch or feel, taste and smell. It’s language that describes how we observe and know things about the world around us. Our senses, afterall, are the ways through which we gather information. It’s a new and uncomfortable concept to many, because in business we’re trained and encouraged to use inert language: management-speak, motherhood statements, weasel words. You lay in your childhood bed, in a heavy-eyed stupor of half-sleep, straining to hear the tinkling of sleigh bells and cookie crunching echoing up the staircase and down the hall to your bedroom. What feels like an eternity later, the morning sun’s rays soak into the dark, and you’re springing out of bed like a gazelle. Bounding down the stairs you go, with your heart banging in your chest with excitement for what you’ll find under the Christmas Tree. With your siblings, you’re giggling and scuttling around the scattered pile of red, gold, silver and green ribbon- and wrapping-clad, odd-shaped and varied-sized gifts; wide-eyed and grinning in the fairy-light glow reflecting off the silver and gold tree ornaments. Your father dances clumsily down the stairs in your wake, attempting a baratone rendition of “It’s starting to look a lot like Christmas…” There’s the scent of cinnamon-spiked hot chocolate, that you know, without turning to look, is what your mother is stirring right now in the kitchen. It’s confirmed as she saunters into the lounge room balancing a tray of steaming blue mug-fuls, and you all squeal because that’s the unspoken tradition that you can now begin exchanging gifts. Your first is from Santa, handed to you by your father. The parcel is wiggling and it’s making strange yippy noises! Tearing at the wrapping while butterflies flap in your tummy, you’re enveloped by the magical feeling that is completely unique to a childhood Christmas Morning. 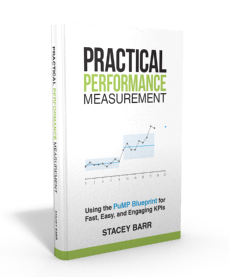 … So, before you search for your next performance measure, start with the question “what would we observe if this performance result were real, now?” Create a sensory-rich description of the evidence that would convince you of the result’s achievement. That evidence becomes the clues for what to measure. Have a happy Christmas, with your attention constantly seeking the myriad twinkling, comforting, delicious, scented and melodic moments that collectively make this time of year uniquely special. I LOVED this post. The fact you started with ‘if we were to measure Christmas….” Also delighted for you, your sister, and family in a healthy, happy celebration. Hi Stacey, what a pity I did not read your latest newsletter sooner! As an HRM professor here in Barcelona, I was running a little KPI workshop this morning with some Masters students and your little xmas story would have fitted in beautifully for attempting to measure the intangible. However, the story may inspire me to create one of my own fables for the future – perhaps based around Valentines Day. Gracias, feliz navidad y un prospero año nuevo para todo la familia!! ** Cycle time reduced to 10 minute per gift at most. Cycle time even more optimized thanks to the possibility to acquire gifts for more than one person in just a few clicks, no time spent in queues. 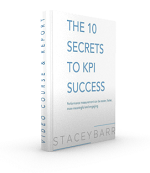 ** KPI 3 and 5 are void when Wish List is used, although non-updated lists may cause issues. I have only been following your newsletter and blog for a few months and from the first one I read I feel like a child on Christmas day when I see it in my in-box. Your personality is so fun and your insight really helps me understand this very new area of my work. I moved, in April, from Statistics Canada to Canada’s newly established Department – Shared Services Canada working on the Perfomance Measurement Framework team. I could not be doing anything more different if I tried and your newsletters and website have provide such an amazing resource for me. I am currently developing a workshop for my colleagues from whom I have to collect Performance data and will definitely incorporate sensory language. As you can imagine, 1) getting a new department off the ground is a challenge as we have no (or very few) benchmarks from which to measure performance and 2) we have a challenge to make people understand that measuring how well the lights are working is as important as keeping them on. I think this may help. I would also, especially, like say how happy I am for your sister and your family that you have health to celebrate together this Christmas. May it always be. Merry Christmas and I can’t wait for the New Year’s Newsletter. PS – we know that West Austrailia struggled with Shared Services and I was wondering if you had any thoughts or advice on how to avoid the same mistakes they made.